14 July 2010, at 10:36a.m. NETHERLANDS - Four new publications are now available from Pas Reform, that together describe SmartProTM, Pas Reform's next generation incubator for the future-focused hatchery. SmartPro introduces Pas Reform's latest and most advanced development for modular single-stage incubation to date: a solution that enables Circadian IncubationTM. Circadian Incubation discusses the latest developments in modular single-stage equipment, to support the use of thermal stimulation for highly uniform batches of robust, high quality chicks in the future-focused hatchery. Pas Reform Academy includes a series of specialist articles, written to provide essential tools that help the hatchery manager achieve optimised performance in modern hatchery practice. 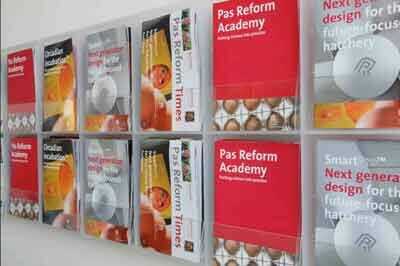 Pas Reform's new publications are available free of charge, either by download from Pas Reform online [click here] or email info@pasreform.com to request printed copies.